Dapsis has been a lover of insects since the age of five. He earned his master’s degree in entomology at the University of Massachusetts Amherst. Thirty-six years of professional[LD3] pest management experience (at Ocean Spray and Black Flag) includes working with insects common in vegetable crops, cranberries, and in households. All the street creds needed to be a walking encyclopedia of tick facts. Larry told us that tick activity has been especially high in spring 2018, with its greater than normal precipitation. Tick populations grow when it is wet, because of the higher ambient humidity (it’s not the rain that matters per se, it’s the humidity). Ticks are moisture-seekers and thus can stay out for longer periods of time hunting for dinner in damp or rainy weather. On the other hand, when it is dry, they bury deeper into leaf litter in search of moisture. A somewhat new revelation, supported by research data, is that the incidence of Lyme disease on the islands of Nantucket and Martha’s Vineyard is much higher than the incidence in the rest of the state… because humidity is higher on these islands since they are surrounded by water. Another recent finding is that Barnstable County (Cape Cod) is the only county in the state in which the incidence rate is not rising. This has gotten the attention of the Harvard School of Medicine. As they looked into this statistic, they discovered that Barnstable also happens to be the only county in the state with an aggressive education program. Larry was recently interviewed by a writer for public radio working on a series of stories on their exceptional educational efforts. 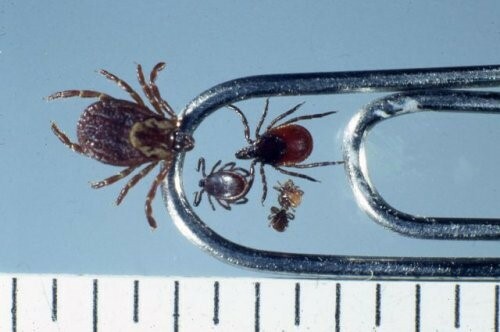 In Massachusetts, we have three tick species to be aware of, the deer tick, dog tick and Lone Star Tick. Lone Star is widely spread on Cape Cod and the islands. Deer ticks can vector the pathogens that cause five different diseases. Deer ticks carry Lyme Disease. Lyme is the most prevalent infectious disease in Massachusetts and is now considered to be a public health crisis. In addition to Lyme, deer ticks can carry pathogens which cause Babesiosis, Anaplasmosis, relapsing fever and Powassan virus, all of which can be very serious. How do ticks spread from one area to another? Migratory birds can introduce ticks to a new area. This seems to be what happened on Cape Cod. Other animals can then move them around locally like wild turkey and coyotes. When are ticks active in Massachusetts? The risk of infection is year round, but the greatest risk is from the nymph stage (late May) into August when 25% of people are infected and the bite is more difficult to detect. The greatest risk is NOT from tick adults: their bite is more likely to be noticed. How do I get a tick tested for disease? If you found a tick and want to get it tested, it is very easy, just click here. Massachusetts residents have the chance to get a reduced rate through a special CDC grant, until the funding runs out (likely around August 2018). Regarding the use of Permethrin around cats, Claire Willey, pharmacist at Tufts University School of Veterinary Medicine, said, “You should never apply Permethrin directly to cats since it is highly toxic to them. Cats are not capable of metabolizing this chemical in the liver, so it can build up, causing tremors and seizures. If you have a house with dogs and cats, even though dogs can absorb it, we recommend not using Permethrin, as cats can be exposed." Dapsis said that clothing treated with Permethrin (when applied in a factory) is safe around cats. Dr. Jennifer Graham, associate professor at Cummings School of Veterinary Medicine, Tufts University, advises that when considering Permethrin use near bodies of water (with fish or other aquatic animals), use the following guidelines: Permethrin should be kept out of lakes, streams, or ponds. Do not contaminate water by cleaning equipment or by disposing of wastes near a body of water. Permethrin may not be applied when weather conditions favor drift from treated areas. Permethrin degrades rapidly in water, although it can persist in sediments. Thank you to the Extension Toxicology Network, a pesticide information project of cooperative extension offices of Cornell University, Michigan State University, Oregon State University, and University of California at Davis, for providing guidance. By far, Permethrin is the most effective tool in the box. This insecticide can be sprayed onto clothing where it will remain effective through six washings, or one can purchase factory-treated clothing where Permethrin remains active in repelling insects through 70 washings. Larry Dapsis tells us that 60 seconds of exposure to Permethrin is sufficient to kill ticks. Treating footwear is very important since nymph stage ticks (poppy seed-sized) bury into leaf litter on the ground. If you are treating pants, turn them inside out after the spray dries and then finish by treating the bottom 6” of cuff. Children under age of 10 have a higher incidence of Lyme disease than any other age bracket. Why is that? Dapsis believes it is because they are not using enough Permethrin in footwear and outer clothing. It is highly effective in killing the tick upon contact with treated clothing, and the tick is guaranteed to die. But the question must be asked, is it safe? Professor Rich shared that, “Permethrin is safe for humans but not for arthropods (including ticks). It works against the arthropod nervous system by disrupting sodium channels. The ion channels of mammals (like us) are not as susceptible to pyrethroids (eg. permethrin). It’s also thought that mammals have higher metabolic rates and so the pyrethroids break down quickly before they have an opportunity to act against neural cells. Empirically, we know that permethrin has very little toxicity in mammals and appears to have no carcinogenic activity.” The Centers for Disease Control (CDC) states that permethrin cream can be used on children as young as 2 months of age. There are no studies available on use from birth up to two months. According to a 2017 EPA document https://www.epa.gov/insect-repellents/repellent-treated-clothing , the toxicity profile is extremely low for humans. Permethrin has low dermal absorption. As with any insecticide, read the label and use the product according to manufacturer’s instructions.